If you're all about relaxed dressing when it comes to your personal style, you'll love this totaly stylish combo of a white and black horizontal striped crew-neck sweater and silver earrings. Choose a pair of black suede pumps to va-va-voom your outfit. 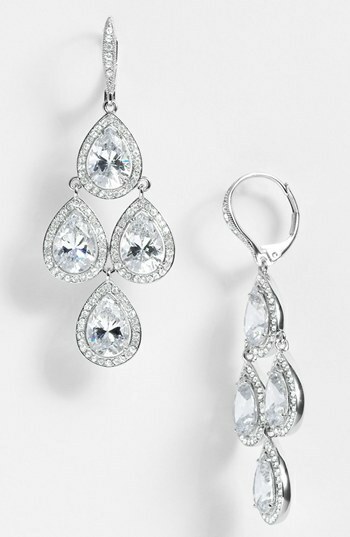 If you're obsessed with relaxed dressing when it comes to fashion, you'll love this extra cute combo of a white cutout evening dress and Nadri cubic zirconia chandelier earrings from Nordstrom. If you're in search of a casual yet incredibly stylish outfit, wear a yellow chiffon evening dress and Nadri cubic zirconia chandelier earrings. Both of these garments are super comfortable and they also look incredible when paired together. Bump up the cool of your ensemble by finishing off with beige leather pumps. If you're all about feeling relaxed when it comes to dressing up, this combination of a white cutout bodycon dress and Nadri cubic zirconia chandelier earrings from Nordstrom is totally for you. You could perhaps get a little creative when it comes to footwear and elevate your outfit with white leather heeled sandals. If you're a fan of relaxed dressing when it comes to fashion, you'll love this cute pairing of a red coat and Nadri cubic zirconia chandelier earrings. A pair of red satin heeled sandals will add more polish to your overall look. If you're on a mission for a casual yet incredibly chic outfit, go for a light blue fur coat and silver earrings. As well as very comfy, these two pieces look great paired together. If you're on a mission for a casual yet seriously chic look, try teaming a dark purple evening dress with Nadri cubic zirconia chandelier earrings from Nordstrom. As well as super comfortable, these items look great when paired together. If you're a fan of relaxed dressing when it comes to fashion, you'll love this seriously stylish pairing of a black crochet shift dress and Nadri cubic zirconia chandelier earrings. Why not add black suede thong sandals to the mix for a more relaxed feel? 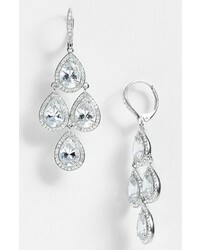 Choose a beige slit evening dress and Nadri cubic zirconia chandelier earrings to be both neat and relaxed. Bump up the cool of your ensemble by finishing off with silver leather heeled sandals.